You should know by now that Kate and I are all about everything in moderation. I still like to eat treats when trying to eat healthy, and I’m not about to make some whole-wheat chia seed kale chunk protein “cookie”. When I want a cookie, I want a COOKIE. Enter the small batch. 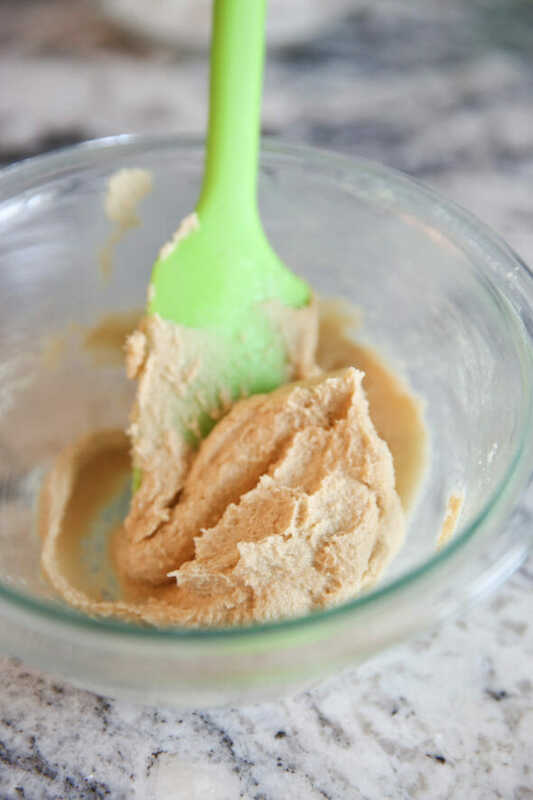 This little recipe makes just 10 perfect cookies, and you can whip it up in a matter of minutes with just one bowl and a mixing spoon. No KitchenAid, no hand mixer, no big bowls, no big mess, no 4 dozen cookies to binge on. It’s perfect for those times you’ve got a cookie craving, or if you live alone or with a small family. This batch is perfect for my whole family to have 1 or 2 and then they’re gone and not tempting me anymore! To make them you can pop your butter in the microwave straight from the fridge. You only need 3 tablespoons. That’s it! 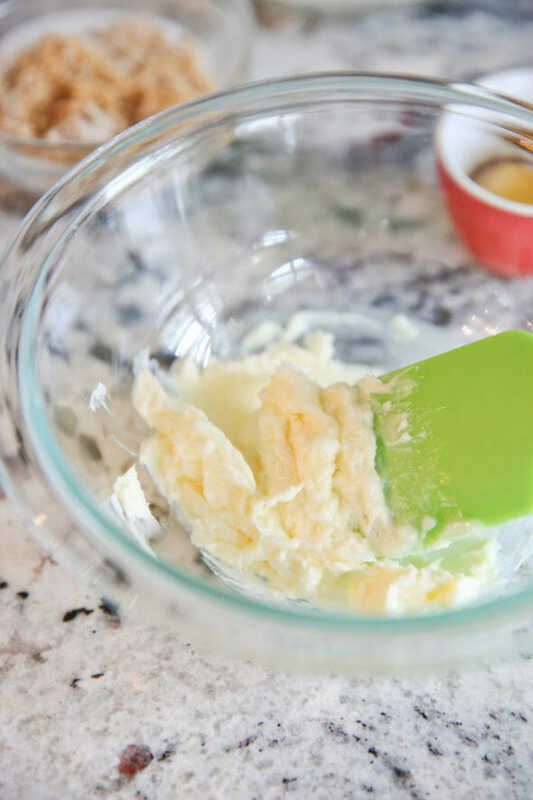 You’ll want it soft enough that you can easily stir it with a spoon, but the good news is that if you try to soften it and end up completely melting it, you’re good! It works great both ways, and the finished texture is slightly different depending on whether your butter was just softened or melted. Try it both ways and see what you like. Mine is just super soft here in the photos. Add in egg yolk and vanilla, and then a little flour, baking soda, and salt. You can use chocolate chips here, or any other add-ins you like. 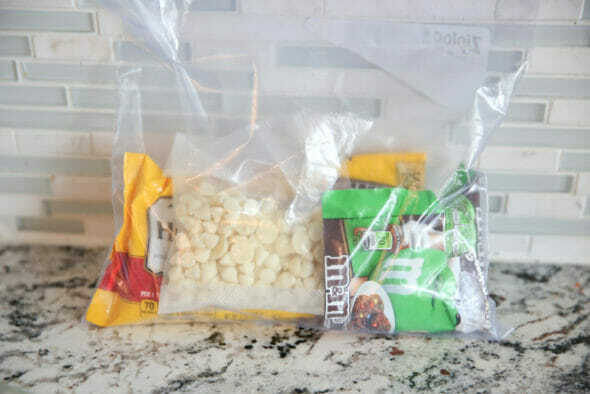 I always have a zip-lock with a random assortment of half-used bags so that’s what I always reach for. Today that means mini semi-sweet chips, white chips, and mini M&M’s. 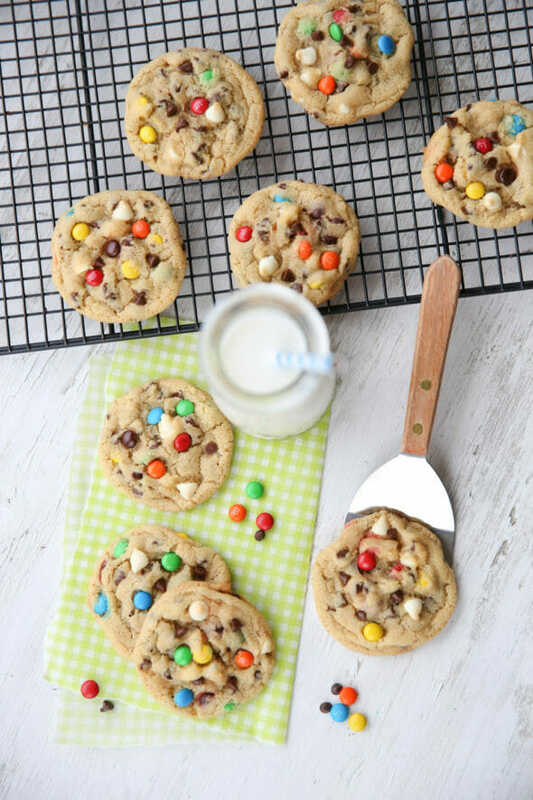 Scoop them onto a cookie sheet and bake until perfection. 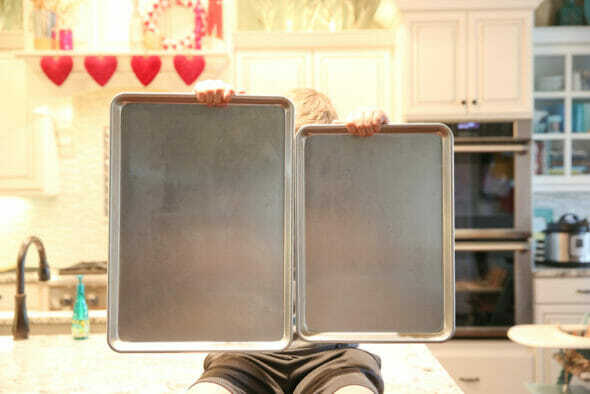 Oh- while we’re talking baking sheets, every time I bake cookies I think about how I need to tell you about my favorite thing ever: the jumbo cookie sheet. The pan on the right is a standard rimmed half-sheet, and the one on the left is an awesome jumbo sheet. It saves so much time by fitting just a few more baked goods on each sheet, I am seriously in love with these big pans. They also make great trays and cooling pans for things like caramel corn. You probably need one. Anyway, back to cookies. Satisfy your sweet tooth without going crazy! These really are perfection. So quick and easy it’s almost dangerous. You can put on your PJ’s and whip up a batch during the opening credits of a movie and eat the whole batch before said movie is finished. 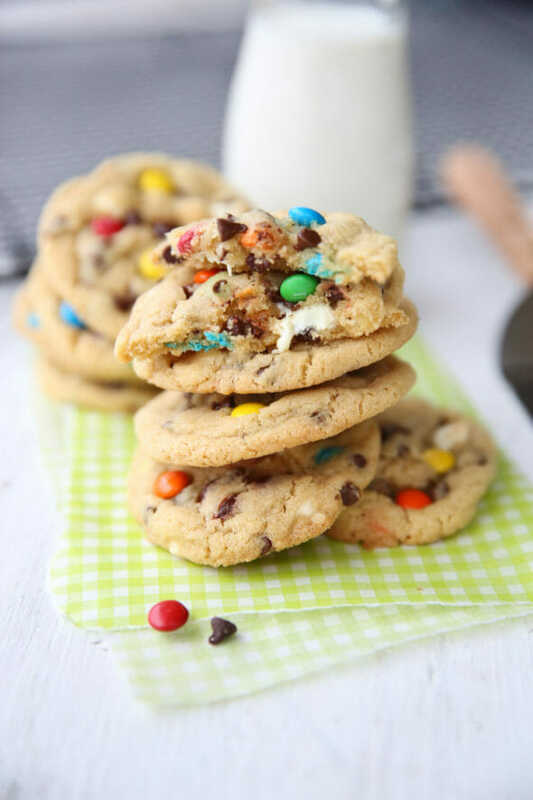 The perfect mini batch, resulting in just one pan of scrumptious chocolate chip cookies. Enough to enjoy, but not over-indulge! Preheat oven to 350 degrees. Line a baking sheet with parchment or non-stick mat. Place butter in a small-medium sized mixing bowl and microwave for about 8-10 seconds. It should be soft enough to mix easily with a spoon, even semi-melted to completely melted is okay. Add sugar and beat with a rubber spatula or wooden spoon till fluffy. Add in egg yolk and vanilla and mix well until fully incorporated. Add flour, baking soda, and salt all at once and mix until all combined. 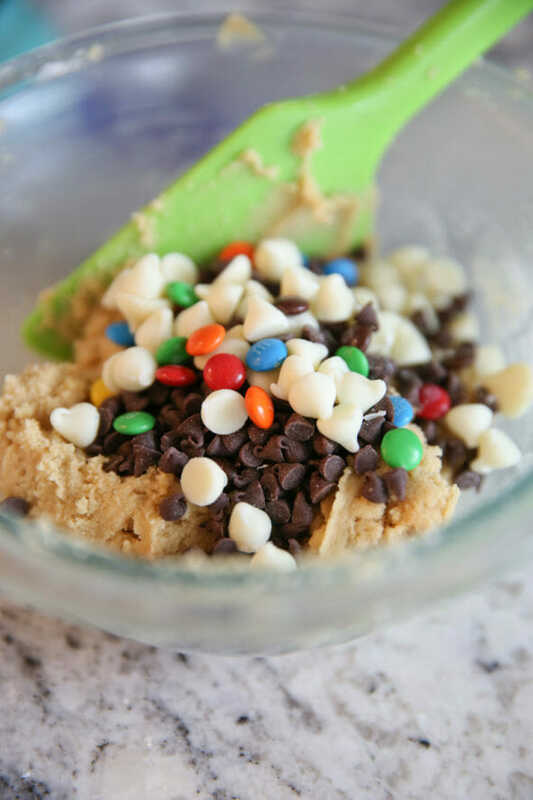 Add your chocolate chips or other add-ins and mix. Use a cookie scoop, or roll into balls. Bake for about 9-10 minutes. Cool for 1-2 minutes on baking sheet and then transfer to cooking rack. You can make this recipe with softened butter, or completely melted butter. 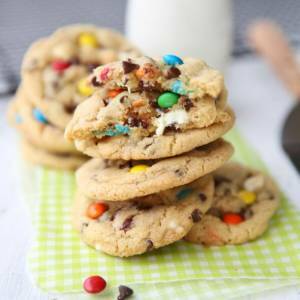 Both methods yield delicious cookies with slightly different textures. Try both and see which you prefer! I have 5 kids, so no need for a small batch around here…but the big baking sheet is what caught my eye. I’ve been wanting something bigger for a while and grabbed one at Costco and got it home only to find out it was TOO big for my oven. I followed the link and measured my oven and it’s on my Amazon wish list now- thanks!! We too believe in still eating treats while eating healthy. Everything in moderation is key! And yes we eat the whole batch of anything we make, so this is the perfect size recipe! Thanks for sharing! Just when my stress-baking habit was starting to threaten my diet, OBB comes to the rescue. This is perfection! Brilliant! I love it when you’re a genius. Quick question: If I wanted to double this could I use a whole egg instead of 2 egg yolks? That should work, right? Yes, I realize the irony of this question when the whole point is to make a small batch, but double would be exactly perfect for my young women or for everyone in my family to have 2 for a family night treat and one in their lunch the next day. Yep, just use one whole egg and it should work. 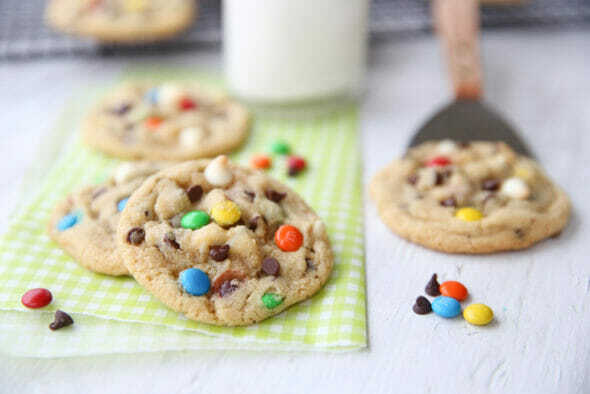 To be honest, I’ve never doubled this one, I always make one of our other chocolate chip recipes on this site, but you should be fine! Oh my goodness! I made your coconut chocolate chip oatmeal cookies yesterday! Yum! I tripled the batch, and made them big sized. Bad idea, now I’m sipping on a kale, mango, Chia seed smoothie fighting the urge to Eat All The Cookies! (I will surrender to that urge very shortly, seriously, I will eat most of the remaining cookies. But hey they have oatmeal in them.) I did, however, give some to my neighbors and send some with my boys to school. Small batch cookies,fantastic idea! I wish I had seen this yesterday, I would have recognized the greatness of small batch cookies and not tripled the recipe. I doubled it, just used one whole extra large egg. They turned out great. What does it say about me when my first thought about this wonderful idea is … “Oh yum! I bet I could double the recipe. “. ? But seriously. What a great idea! I too love my Sunday or rainy day baking! I need to make these asap! They look amazing! So by 10 cookies, you mean a ‘perfect small batch for one’ right? Cause yesterday I made a batch of oatmeal cookies. It made 4 dozen. I gave away 3 dozen. Each of my kids had 2…..and then I ate 8 freaking cookies. So maybe if I made these, I would only eat 6?? They look so yummy too. However, let’s not assume I have half full baggies full of different chocolate chips or m&ms. 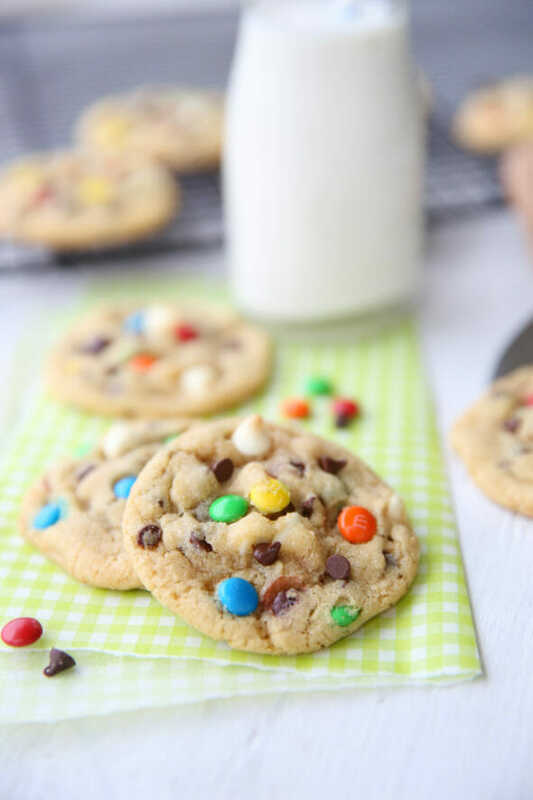 If I ever use half a bag of any baking chip or candy there is a 99.9% chance that the rest will just be consumed by the handful by yours truly….you know, so they get out of my house and stop tempting me. It makes sense in my head. Curse you! No really, I also love to bake but have limited places to send extra cookies, but feel guilty eating too many so… this is PERFECT! I made these last night with my 6 year old. Super fun and very easy for her to do. Thanks so much for the recipe! I made these, and we did indeed eat them all, but my dough was dryer than I like. Any suggestions? Maybe my yolk was too small or I put in a pinch too much flour? I love this small batch idea! So perfect! Don’t know whether to curse you or praise you for this! 😉 Thank you, I think. Weird question. How do you get your cookies to spread out so nicely? You know, so they are thin, instead of a big clump! I followed the recipe, rolling them into balls, but they seemed to stay that way. Does it have to do with using melted or softened butter? Thanks. It could be a lot of things. 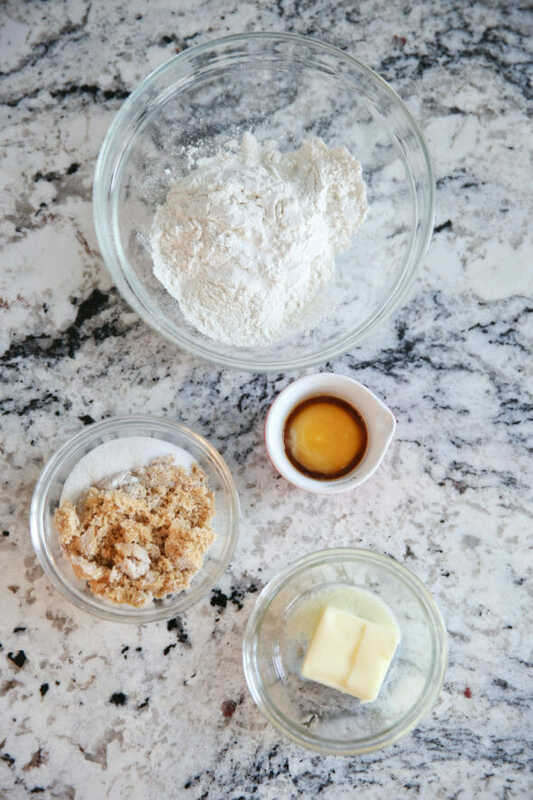 Make sure when you measure your flour, you’re not scooping it up with the measuring cup. Use a spoon to lightly spoon it into the cup and then level it off with a knife (otherwise you could be adding too much flour and that could be the problem.) Make sure your oven is preheated, and if you still have any issue, you could always pat them down a bit before baking, but they shouldn’t need that! Are you at a high elevation? That could play a role in different outcomes as well. I had the same problem with my cookies staying in little mounds. But they taste great so I’m not complaining (neither is anyone in my family). 🙂 I measured the flour lightly (scoop with spoon and level method) and am not at high elevation. But I also used softened butter. Next time I will try it with melted butter. And there will definitely be a next time. This is perfect! I have a small family – me, husband, daughter – and I love to bake but we always have so much leftover. Great solution! I think that it is so cute that you put in a bunch of different types of chocolate. 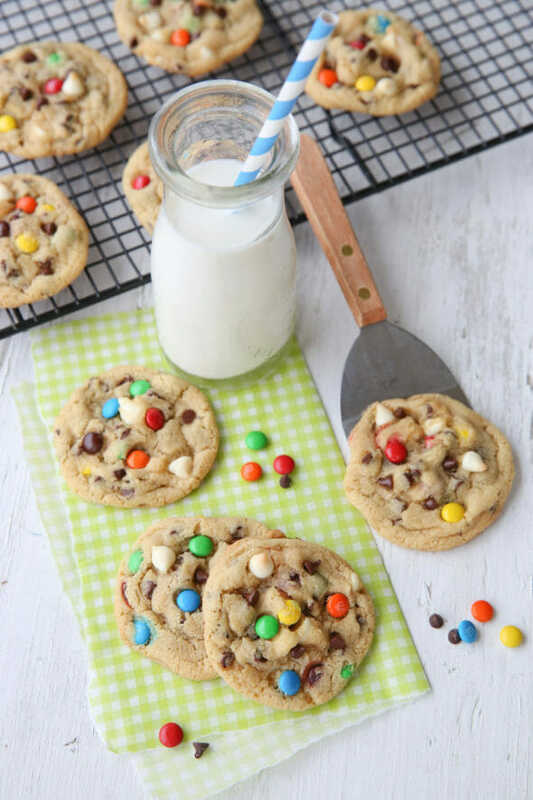 I think colored M&Ms are really fun as well as the white chocolate chips. I wonder how good this would taste with butterscotch. Guess what? This is the perfect amount to fit into a skillet or pie plate for pizookies! YES! I’ve done that too! These are delicious, and just the right amount. Thank you! I made this and they were just okay. I did have to add an extra egg yolk and a teaspoon of milk. Also less flour, maybe just a 1/2 cup of flour, because the cookies were a tad “floury” tasting. Thanks! Just made these. Half of ’em are already gone. These are sooooooooooo yummy! Thank You! 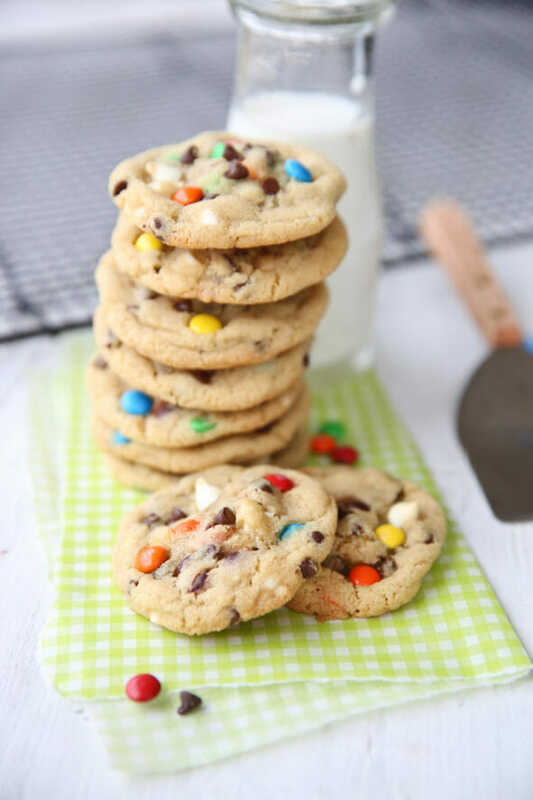 My 10 year old and I made these tonight – perfect for our family of 5. Two for each of us and mom does not end up eating the leftovers!! Of course my kiddos said they were so yummy that we needed to make them every night after dinner since there weren’t any leftovers. Also love that there is very little clean up afterward. The jumbo pans are great! At the restaurant Costco in Seattle they have them for only a few dollars each. They are called 2/3 sized sheet pans. Thanks for a small batch recipe! I love mashing cookies and also have no self control.